President Pranab Mukherjee's term expires on July 24. BJP leader Shatrughan Sinha has been sharing responses by people who support LK Advani. 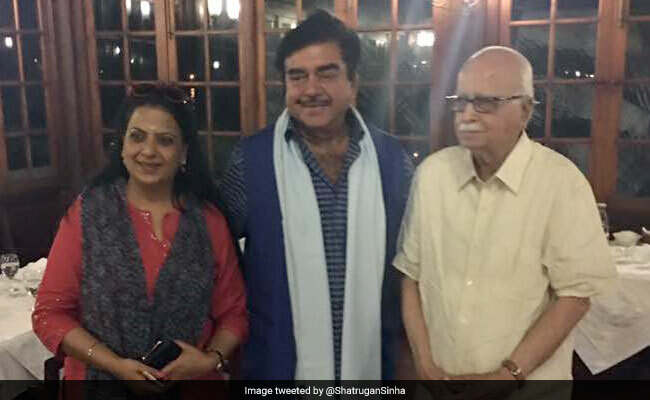 With the BJP confirming that it will announce its nominee for the next President of India by June 23, party leader Shatrughan Sinha appears to have made his choice. Since Tuesday evening, Mr Sinha, a former actor, has been tweeting in support of BJP veteran LK Advani. In his posts, he has been sharing people's responses who support Mr Advani's candidature for the country's President. ...of the Constitution & to take the right decision when needed without getting influenced by anyone, in the larger interest of the Nation." Mr Sinha is part of a small bloc led by Mr Advani that in 2013 unsuccessfully urged the BJP not pick then Gujarat Chief Minister Narendra Modi as its presumptive prime minister. Supporters of these leaders say that they have been relegated to the sidelines by PM Modi and BJP chief Amit Shah. Mr Advani ,for example, who is 89, was placed on a committee of mentors that is meant to guide the party, but has no authority. Known as "Shotgun" on account of his rapid-fire quips and filmy one-liners, Mr Sinha has been a frequent critic of his party in recent years and has conferred and met with opposition leaders like Arvind Kejriwal and Bihar Chief Minister Nitish Kumar, timing his interaction to when their hostilities with the BJP were heightened. The BJP has appointed three ministers- Arun Jaitley, who is abroad till this weekend, Rajnath Singh and Venkaiah Naidu -to meet with its allies and opposition parties to see if a candidate that all agree upon can be determined. Tomorrow, the ministers will meet with Congress chief Sonia Gandhi and Left leader Sitaram Yechury. Parties that they have already spoken to- like Mayawati's BSP and Sharad Pawar's NCP -say no contenders have so far been discussed. That would make an election unnecessary, but if a settlement is not reached, voting will be held on July 17; results will be declared three days later. Mr Advani took a career hit recently with the Supreme Court ruling that along with other senior BJP leaders, he will be tried for conspiracy in the destruction of the 16th century Babri Masjid in Ayodhya in 1992. Mr Advani and the others named with him have denied the charges and their party has said it is confident they will win the case. The Uttar Pradesh court handling the trial has been given two years to deliver its verdict. BJP sources have indicated that the party could choose from Foreign Minister Sushma Swaraj, Lok Sabha Speaker Sumitra Mahajan and Social Justice Minister Thaverchand Gehlot. Sources say the party wants to choose someone who is from the BJP with strong ideological roots and whose nomination will convey an effective message to the BJP's supporters and the public. Jharkhand Governor Draupadi Murmu, who is an Adivasi from Odisha, is also believed to be a strong contender.